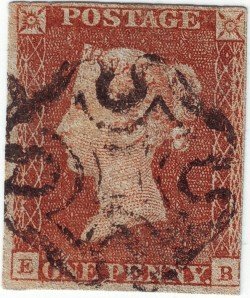 1d Red stamp lettered E - B identified as coming from black plate 11 using Guide Lines to the Penny Black by P C Litchfield. Period of use: The very first printings from Plate 11 were made on 29 and 30th January, 1941 in red, rather than black, with the imprimatur copies registered at Somerset House also being in red. The first black printing was made on 1st February. This is the only plate where red stamps were printed before black. Cancellation: Maltese Cross cancellation in black ink. Top line of NE square broken at left corner. Top right serif of letter E faint. Ray flaw in the right star - missing no. 7 (counting clockwise). Next post: Happy Birthday Bob Dylan!